Disneyland, a place almost every child dreams of. I’ve never been to one, and so I decided to find out how wheelchair accessible Disneyland Paris is. In this article, I’ll give you some good advice, tips, and tricks as well as detailed information on the attractions for wheelchair users. Disneyland Paris is an entertainment resort in Marne-La-Vallée near Paris. The famous resort was the second Disney Park to open outside the United States in April 1992. Another theme park, the Walt Disney Studios Park, opened in 2002. Disneyland Paris is the most visited entertainment resort in Europe. Disneyland Paris is located about 45 km (30 miles) east of Paris. It takes approximately 1 hour to get there by car. There are enough parking lots for disabled visitors (20 EUR/day). Of course, you can also get to Disneyland Paris by train. We took a flight to Paris-Charles de Gaulle Airport, and from there we took the TGV (high-speed bullet train) to Disneyland Train Station Marne La Vallée-Chessy. This train leaves at CDG Airport train station in Terminal 2, and the ride to Disneyland takes only 9 minutes. The Disney Magical Shuttle is not wheelchair accessible, but an accessible transfer service can be arranged upon email request. 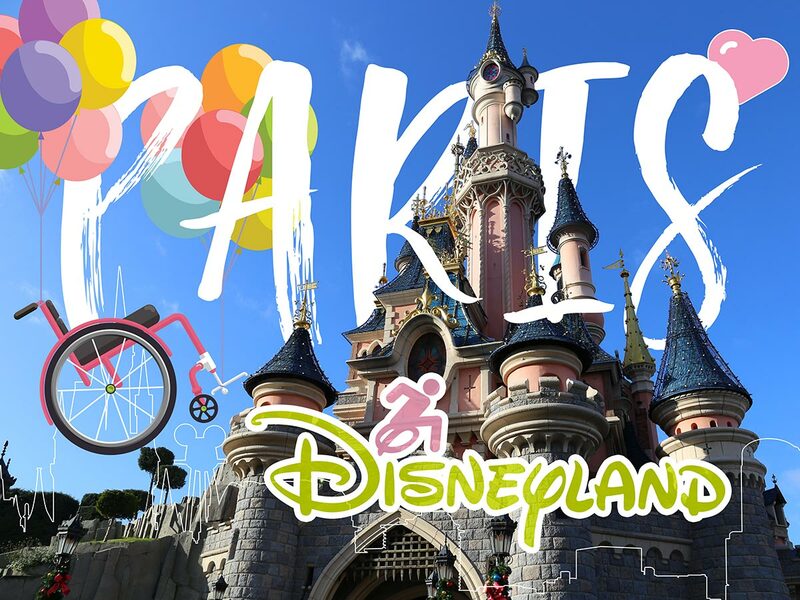 Traveling by train is the fastest, cheapest and also the most wheelchair accessible way from CDG Airport to Disneyland Paris! Purchase your train ticket at the SNCF Ticket Counter in Terminal 2. There are several reduced rates for disabled travelers and their companion. However, these rates unfortunately only apply to French disability card holders. The regular ticket price for one adult varies between EUR 16.50 to EUR 25. 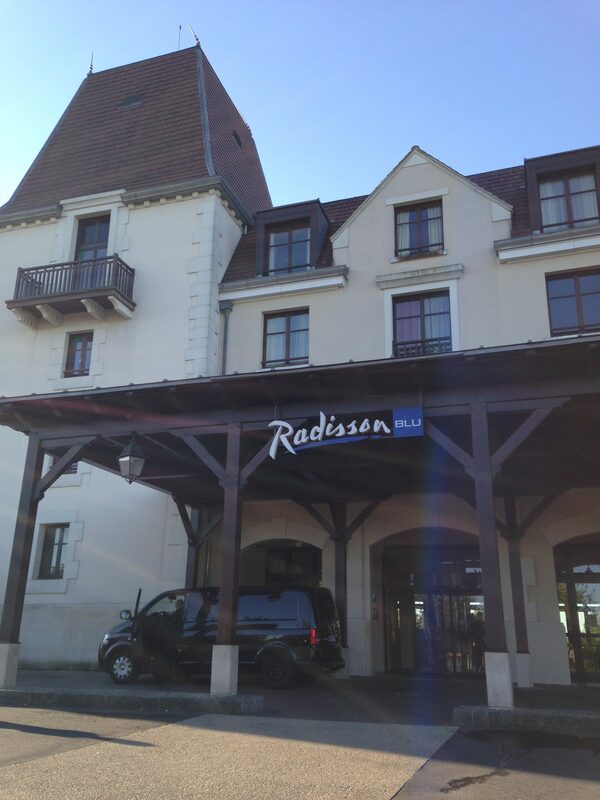 There are many hotels near Disneyland Paris. We booked the Radisson Blu Resort at Disneyland, but unfortunately, I cannot quite recommend this hotel. Although our room category was “Accessible Queen,” the bathroom was equipped with a bathtub. I went back to the reception and asked for a room with a roll-in shower. The receptionist explained that all those rooms were occupied. She told me that the staff didn’t know which of their accessible rooms were equipped with a roll-in shower and that they could not check that in their system. As a proof she even let me have a look at her screen. Anyway, my husband and I arranged us with our room. The hotel offered an accessible free shuttle service to Disneyland and back. The shuttle bus was equipped with a ramp, and the ride only took 10 minutes. The regular one-day ticket price for an adult varies between EUR 47 to EUR 65. 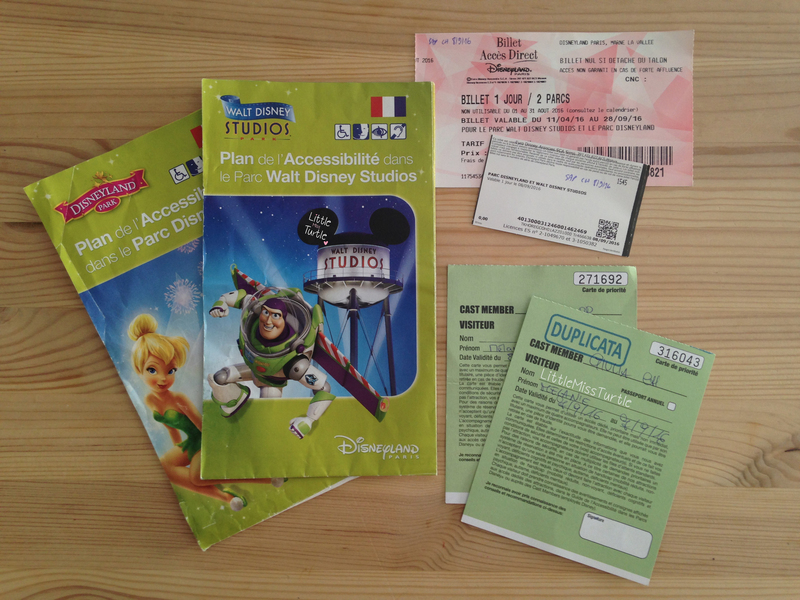 You get access to both Disneyland Paris and Walt Disney Studios Park. Disabled visitors can purchase tickets at a dedicated ticket desk located on the right end of the ticket counters area. When you are severely disabled, and you have a medical confirmation or a disability ID card (French or English), your companion will get a free entry ticket. So here you can save 50 %! Accessibility guides, our entry tickets, and the priority cards. I got the Accessibility Guide to Disneyland Paris and the Walt Disney Studios Park which lists all accessible attractions. As my hubby would help me to transfer, I had a large choice of possible rides. For those of you, who cannot transfer or be transferred: There are some fantastic, completely wheelchair accessible rides where you can stay in your own wheelchair! Buzz Lightyear Laser Blast, The Studio Tram Tour, It’s a small world and Ratatouille! That’s pretty awesome – I’ve never experienced this before! Many other attractions were closed due to renovations work during our visit. So, unfortunately, I couldn’t test all accessible rides. My favorite rides were Buzz Lightyear Laser Blast, Pirates of the Caribbean, The Studio Tram Tour, Ratatouille and Toy Soldiers Parachute Drop. We also did the Disney Railroad Express, Phantom Manor, Autopia, Casey Jr. Train and Slinky Dog. All of those require to transfer from your wheelchair. Honestly, the Railroad Express wasn’t worth waiting as there is not much to see on the ride. Alice’s Labyrinth, Mysteries of Nautilus, Armageddon, Aladdin’s Passage as well as The Dragon Cave are also entirely wheelchair accessible. In the evening, we watched the stunning Magic Hours Show! Wheelchair users should come early to make it to the dedicated wheelchair area, as it can get very crowded right before the show. You really shouldn’t miss it! Both parks are perfectly wheelchair accessible. The staff was friendly and very willing to help. Wheelchair accessible bathrooms are everywhere. I had a great time at Disneyland Paris and the Walt Disney Studios and can definitely recommend it to wheelchair users! Wheelchair accessible attractions like It’s a small world, Buzz Lightyear Laser Blast, etc. Très belle pub. pour inciter les gens à aller à Disneyland. Te reste à l’envoyer aux premiers concernés. We took a taxi in order to get to our hotel. Many hotels around Disneyland offer a shuttle bus, which takes you from the TGV station to the hotel. Maybe ask your hotel if they do offer such a service. If they don’t, I would take a wheelchair accessible taxi. For example, the team of Taxi G7 – Horizon (https://www.g7.fr/en/discover-our-services/g7-access-taxi) speaks English and they are specialised in the transport of people with disabilities. Have a wonderful time at Disneyland Paris!